What’s with the funny twitter handle? 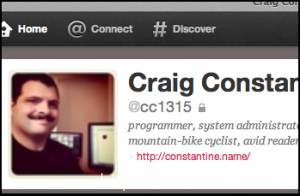 cc1315 was my InterNIC handle. Back in the mid-90s, there was only one place to register a domain name. (See Network Solutions.) To register a domain, or to make changes, one sent a specially formatted email message to a special email address at Network Solutions. On the receiving side, a program would read the message and follow the instructions. To verify the request was valid, the program checked the message for a valid InterNic handle. To obtain a handle one would register with the Internic by sending a formatted email message containing your name, address, and other contact information. The InterNic software would then create a globally unique handle in response. Some program back in 1994 saw my initials and added 1315 — cc1315. I never managed to figure out the source of the 1315. If memory serves, the handles were always two initials and three or four digits. So my best guess has always been that the digits were the local time-of-day when my registration was received.